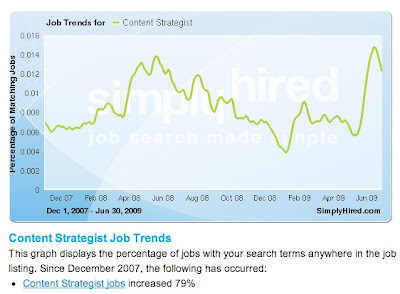 Despite the bad economy, the number or job postings for content strategists is up 79% since January 2008 according to statistics gathered by job posting aggregator, SimplyHired.com. I'm guessing that projects get ramped up early in the year, things really heat up in late spring content-strategy-wise, then new hiring slows down as projects end and everyone waits to see what budgets are like for the next year. This year's peak in June was higher than the peak in 2008. 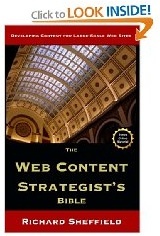 More evidence that content strategy is continuing to expand as a practice. We must be doing something right! Any way you look at it, this is good news for content strategy as a practice and for working and aspiring content strategists.